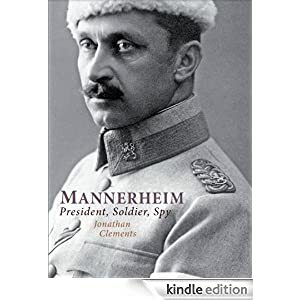 At long last, my biography of Mannerheim is out on the Kindle. Leading a charge on horseback against Japanese cannons in Manchuria? Two years undercover, spying on the Chinese, while disguised as a Swedish anthropologist? Standing up to a gang of Bolsheviks clad in nothing but a pink bathrobe and a pair of cavalry boots? Accidentally becoming the president of Finland? You wouldn’t believe it… but every word is true. This entry was posted in News and tagged Finland, Kindle, Mannerheim by ixarette. Bookmark the permalink.